Having a henna night before your wedding day is a great way to bring your female friends and family members together to have fun and enjoy each other's company. You should always stick to the oriental theme when it comes to your henna night. After all, that’s what it's all about right? Think Arabian Nights! What is a henna night? Traditionally, a Henna Night consists of the female relatives and friends of the bride getting their hands and feet painted with Henna. Henna Traditions: Although these traditions were taken seriously in the past, nowadays a Henna Night is only a fun event to celebrate the bride. But just for your own information, Henna Nights were usually held the day before the wedding. The bride's Trousseau is taken from her home to her new home. Is Henna Night different from the bridal shower? Henna nights and Bridal Showers are quite similar in concept; they are both held to celebrate the bride before getting married. Except that Henna Night is more traditional and focuses on the grooming of the bride. When hosting a Henna Night, there are standards and traditions that should be taken into consideration. It always has the same theme, unlike bridal showers where you can have it however you want. You don't have to invite every female you know to your henna party, invite your close friends and family members, it will make it more meaningful. Wear a colorful and oriental dress, but nothing too complicated to remove in case you end up having henna drawn on your hands. You don't want your dress to ruin it, or get ruined by it. Music is very important, you can ask friends to make you CDs or make them yourself. You can even hire a DJ. Food should be presented very nicely, use stylish tableware to present it. 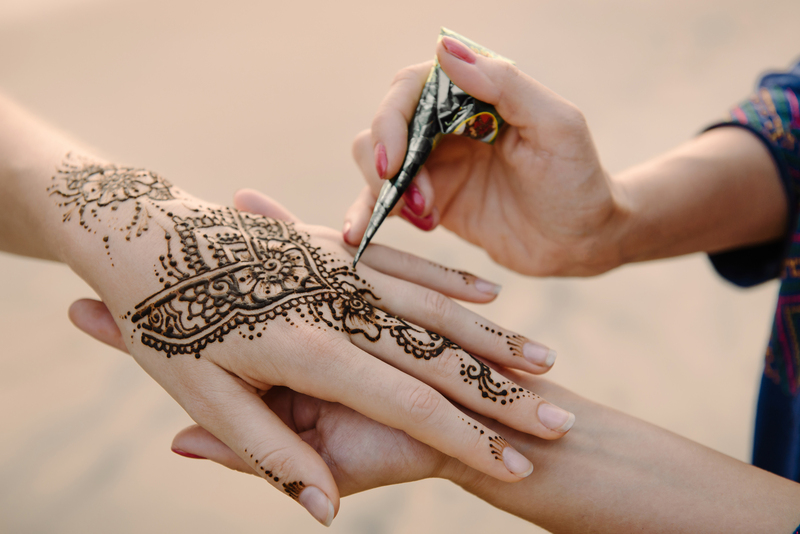 Depending on how long your guest list is, you might need one or more henna artists. Consult with your henna artist before your Henna Night so she can have a more specific idea of what you want. If you're looking for something creative that will have you and your guests laughing all night, ask around for a belly dance instructor, and make her come for an hour to give you and your guests a belly dancing class. Another great idea is to hire a palm reader or fortune teller. Your guests will love it. Have a main cake to cut and serve your guests from. You can either invite your guests by phone or by sending them invitations. But if you decide on sending invitation cards, have your party invitations decorated in henna or oriental patterns or beads. Decorate them however you prefer. And don't forget to mention to your guests that they should wear outfits that will fit the theme. Decorate the place with cushions, rugs, candles and lamps. If you're having your party outdoors, consider having a Moroccan tent. Have a couple of hookahs or shishas (water pipes) set for your guests. Or just to complete the theme. Have some fun accessories ready for your guests: abayas, saris, belly dancer outfits and scarves. Last but not least, burn some incense and add some candles to get the perfect ambience. The Henna Night theme gives you plenty of choices and options to work with when it comes to the favors you will be giving to your guests. Here are a few ideas to get you started and inspired: You can decide to just have one or mix and match. Cashmere shawls or "Pashminas": You can get them in one or different colors. Have each one rolled and tied with a ribbon. Authentic tea cups: Have the traditional glass tea cups filled with candy and wrapped in organza fabric. Incense sets: Wrapped with colored ribbons. Accessory bag: Fill the bag with different oriental accessories: toe rings, ankle bracelets, earrings and even Arabic kohl. Moroccan slippers: Get different sizes and colors and put them in organza bags. Arabesque Jewelry Boxes: They are easily found, and make great practical gifts. Ordinary paper bags: Have them decorated with bright stones or painted in henna patterns. Get creative! Fabric bags: You can find them at any accessory shop; you can have them in different colors too. Or make your own bags from oriental fabric (e.g. saya). You can make your own pouches: find a fabric store near you and have the fabrics cut into squares (depending on your favor size and your guest list). You can choose tulle, velvet, or any kind you want. Have the favor placed in the middle and wrap the sides up, and tie them with a ribbon or beads. Baskets: Have baskets set on a table, with your favors in them. As we mentioned before, a Henna Night theme gives you endless options and ideas, all you have to do is be creative and have fun with it.